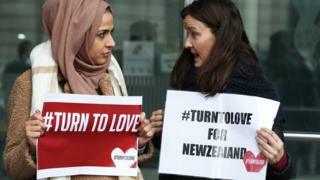 Vigils for the victims of shootings at two mosques in New Zealand have taken place in the UK, amid an outpouring of support for Britain’s Muslim community. The attacks in Christchurch, which have left 49 dead and at least 40 injured, have been condemned by public figures. The Queen said she was “deeply saddened” by the shootings, and PM Theresa May called it “sickening”. 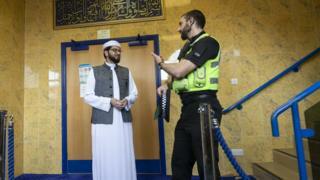 It comes as police have increased patrols at British mosques to provide reassurance. 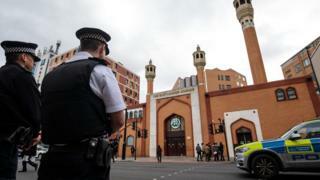 Senior counter-terrorism experts and members of the security services were also due to hold talks with the home secretary on how mosques in the UK can be best protected. The Queen paid tribute to the emergency services and volunteers who helped the injured, and said: “Prince Philip and I send our condolences to the families and friends of those who have lost their lives. She added that her “thoughts and prayers are with all New Zealanders” at this “tragic time”. They ended the message with the Maori words Kia Kaha, meaning “stay strong”. She said the UK stood “shoulder to shoulder” with New Zealand. “There can be no place in our societies for the vile ideology that drives and incites hatred and fear,” the prime minister added. The attacks in Christchurch on Friday, the deadliest in New Zealand’s history, happened as people were attending the mosques for prayers. More than 40 people were wounded in what the country’s prime minister Jacinda Arden described as one of the nation’s “darkest days”. More images here from this afternoon's vigil held in Oldbury following the terrorist attack in New Zealand. 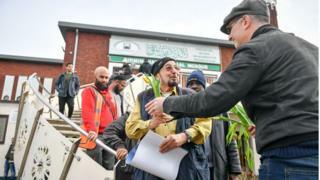 People gathered for prayers at mosques across the UK, including at the East London Mosque and London Muslim Centre, which urged its community to “be more vigilant than ever”. Meanwhile, Finsbury Park Mosque, whose worshippers were targeted in a terror attack in June 2017, shared a picture of flowers and a note of support which it had received from members of the local community. Mohammed Mahmoud, who made headlines when he stood guard over a suspect after that attack in north London, condemned the shootings and called for greater action against far-right extremism. 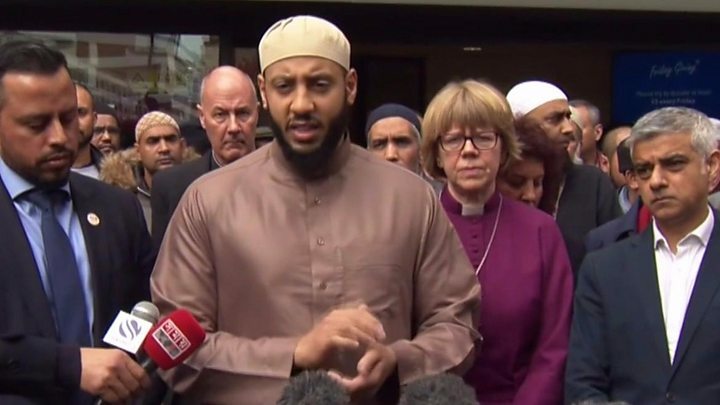 Speaking at a vigil held at East London Mosque, Imam Mahmoud criticised those who perpetuated a “narrative of otherness” towards Muslims. Akeela Ahmed, who belongs to a group of Muslim representatives which advises the government, also called on the British public to “come together” in order to “challenge the extremist narrative promoted by those who seek to create divisions”. Flags have been lowered to half mast at Downing Street and the Foreign Office, as well as in the British town of Christchurch in Dorset, which is twinned with its New Zealand namesake. Mohammed Kozbar, the vice president of the Muslim Association of Britain, said Muslims in the UK would not be intimidated by terror attacks. The Archbishop of Canterbury, Justin Welby, shared a post on Twitter urging Christians to go along to Friday prayers at local mosques. And the Bishop of London, Sarah Mullally, told the BBC that “an attack against faith anywhere is an attack on faith everywhere”. There was sadness and solidarity, but also anger, at a vigil at the East London Mosque, held in memory of the victims of the New Zealand attack. Posters saying “no to Islamophobia” and “this will not divide us” were held up as Mayor of London Sadiq Khan and faith leaders gave short speeches. But among many of the gatherers the BBC spoke to there was also anger and fear. Fear about whether such an attack could happen in the UK. And anger at what they see as the normalisation of Islamophobia in parts of the media and among politicians. “These are the ones we should be pointing the finger at,” said one man who refused to give his name. The London mayor did not name politicians or the media directly, but strongly hinted at their role in influencing people and having a role in them becoming radicalised. “There is a responsibility on all of us to be very careful in the language we use,” he urged. Scottish First Minister Nicola Sturgeon was due to attend a vigil at Glasgow Central Mosque on Friday evening, and said the events in New Zealand “will feel very personal and close to home” for Muslims. Meanwhile, Jeremy Corbyn, the leader of the opposition, laid flowers at the High Commission of New Zealand in London, where members of an anti-terrorism group had gathered. MPs have observed a minute’s silence in the House of Commons. British security minister Ben Wallace called the attack “repugnant” and said the UK “stands shoulder to shoulder with New Zealand against terrorism”. He said he and Home Secretary Sajid Javid would speak to counter-terrorism police chiefs and the security services on Friday, “to discuss what further measures we can take to protect our mosques and our communities from any threats here in the United Kingdom”. Mayor of London Mr Khan described the attacks as “heartbreaking”. He said that, after discussions with Scotland Yard, there would be “highly visible policing around mosques today, as well as armed response officers, as Londoners go to pray”. Met Police Assistant Commissioner Neil Basu, the national policing lead for counter-terrorism, said there was “no intelligence linking these appalling events in Christchurch to the UK”. Mr Basu said there would be more “reassurance patrols” near places of worship and specific communities in the “coming days”. He added that specific attention would be paid to mosques. Greater Manchester Police said “we know all too well the effects of terrorism”. Meanwhile, Met Chief Superintendent Nick Aldworth, who leads the government’s counter-terrorism strategy, told BBC 5 Live that police would be assessing what impact the Christchurch attack could have on Britain. “There’s no doubt in my mind that, having seen what I’ve seen here, this is something that we within counter-terrorism should be responding to in the UK and ensuring our current plans and thinking is correct,” he said. Sir Mark Rowley, the UK’s former head of counter terrorism at the Met Police until last year, told BBC Radio 4’s Today programme that although “Western societies have always had racist thugs” who commit crimes, in recent years they have become “more organised and with more terrorist ambitions”. He said he thought social media had played a role and was “a very big problem”. Downing Street and Home Secretary Mr Javid also criticised social media, saying Facebook, Twitter and YouTube should have been quicker to remove video footage – recorded by the gunman during the attack – from its platforms.